The planet describes the old town as something “right out of an early-20th century picture book.” It is true! 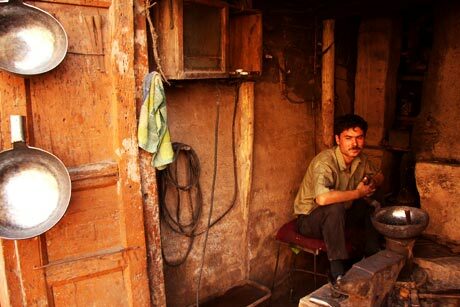 There are street side barbers, and tiny stores with a singular focus or specialization. Like stores that only sell (homemade) cooking pots (one model), keys, fresh vegetables, fruits, tea pots and cups, bread, knifes, etc. Like in India, every city in China officially lives in one timezone, despite the obvious inaccuracies due to the sheer size of China. 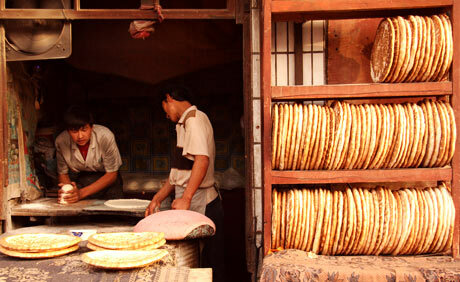 When a local Kashgar-ian speaks of time, they are referring to “Kashgar Time”, which is 2 hours behind the official “Beijing Time”. This was a point of confusion when dealing with local travel agents. Local “Whole Foods” grocery store. Outside the old town, everything is pretty modern and isn’t too interesting to see. We stayed a total of 10 days, and it felt too long. After about 6 days, we were itching to move on to another city. After all, there are only so many times you can circle the windy side alleys of the 20 block radius of old town. There’s not much to do aside from wandering around old town and soaking it all in. 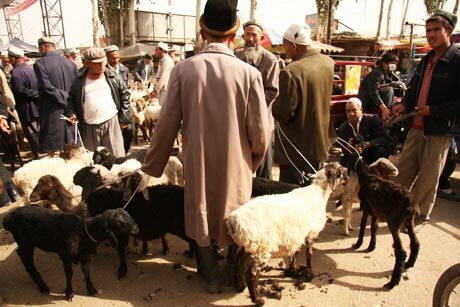 We arrived in Kashgar late on a Sunday afternoon and had to wait a whole week before visiting the ever popular Sunday Market and the Animal (Livestock) Market. When the eagerly anticipated Sunday came around, we were up-and-ready, bright-n-early, camera-in-hand. When we arrived first at the Animal Market at 9:30 am Beijing time, most of the market was just setting up; unloading truck loads of sheep, cows, donkeys and camels. At the same time, buses full of tourists were also being unloaded. I tried my best to blend in at the retail sheep market near the entrance, and it sort of worked.I was particularly fascinated with the activities in this area. You have sellers holding onto their furry product, and buyers wandering through the tightly packed crowd of people assessing the animals with great seriousness – picking them up, checking their teeth, pinching their asses (Sheep have unusually large butts. I have pictures to prove). When the dance of bargaining breaks out, one might mistaken it for a verbal fight. Finally a deal is made, the new owner comes back to their newly purchased animal with a few pieces of lettuce, a tree branch with some green leafs on it, or a few pieces of dried corn. It was all very cute! The wholesale sheep market area made me sad and sick to my stomach, as rows upon rows of sheep are strung together at the neck, unable to move, dehydrated, and kicked as they stand under the mid-day sun. Some seriously looked like they were gonna faint from the heat and over crowding (see picture below, 4 down). Other than sheep, I saw cows, horses, donkeys and camels for sale, along with accessories for handling livestock. No chickens, no pigs, no dogs. 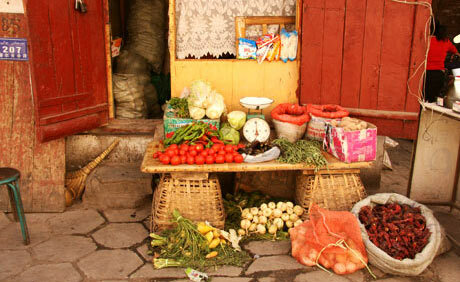 We went to the Sunday market in the afternoon and were horribly underwhelmed and unimpressed. It was pretty touristy and you can find the same items for sale during any other day in old town for a lower price. Left: boy selling horse at live stock market. Right: garlic salesman. 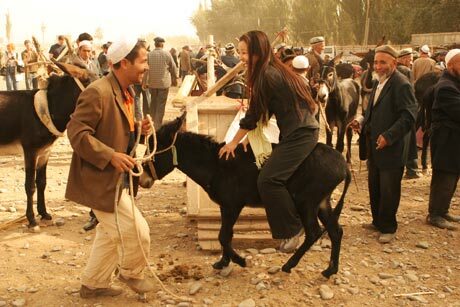 Tina riding a baby donkey at the livestock market. Wholesale sheep market. Sheep tied by the necks in rows. Around Kashgar, Karakul Lake (More to be posted soon) is worth visiting. 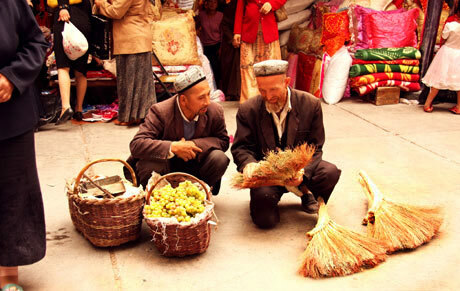 A travel agent said bluntly that it’s the only site around Kashgar worth visiting, and had convinced us that the one-day desert trips are not worth the trouble. 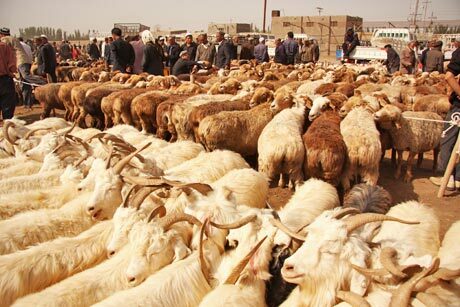 If you do visit Kashgar, make sure to have a full Sunday earlier on in your trip for the animal market. 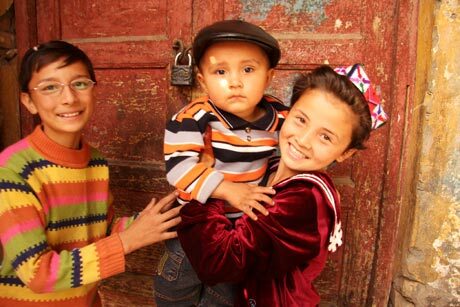 If you’re not there for photography reasons, I would budget 2-4 days for Kashgar, 2 days for Karakul Lake (plus 1-2 days if you are interested in the Karakoram Highway, to visit the Pakistan border), and 2 days for Taklamkan Desert (note: this trip is highly prone to rip-offs by local travel agencies). We stayed at the Chini Bagh Hotel (Qini Wake). I got a swanky double room with internet, it was supposed to cost 380 RMB a night, but if you stay longer than 7 days – which I did, you can ask for a discount resulting in the room costing 280 RMB a night (~ $40 USD) with breakfast. According to the planet, the Chini Bagh has the best value in town. What I loved most, is the super-fast high speed Internet in some double rooms (More on this below if you’re planning to stay here). I spent two whole days in the hotel room writing, and had produced this article (see picture below). Three evenings before we left, I experienced my first earth quake. At around 11pm, the entire building shook back and forth for about a minute. I was in bed reading and was completely immersed in my book when the shaking started. It took about 30 seconds before I realized that my room was moving!! I jumped up, heart thumping out of my chest and was in instant survival mode. Oddly, my first thought after jumping to the door ledge was, “I gotta save my pictures”. Within a split second, I had mentally listed out the things I would run out of the building with if I needed to: (in order) camera, laptop hard drive, backpack containing money and passport. I would just like to say that “it was pretty freakin’ scary!!”. 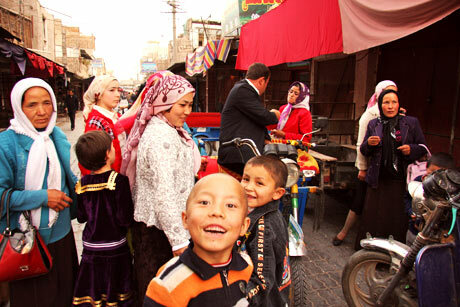 Overall, I loved my experience in Kashgar. It is the most culturally exotic place I’ve ever been to. With landscapes and ethnic richness similar to Tibet, and a cultural resemblance to Morocco; It’s a bold and beautiful mixture of Asian, Eastern European, and Muslim culture. Leaving it, I felt humbled on many levels and was thankful for having experienced it. I’m ready to move on to Beijing. Tina working on this article in hotel room. 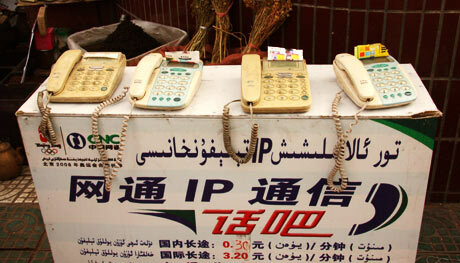 Kashgar, China. Lonely planet doesn’t do that extensive of coverage for Kashgar, or any of the cities in XinJiang. So, if you’re just visiting a few cities in XinJiang, it might be really worthwhile to photocopy pages from the planet to bring with you, instead of lugging the tome that is the China book. For example, the whole of Kashgar and Karakul Lake is covered in only 4 pages (front and back). Lame! Your best option for booking air tickets (for all of China, not just to Kashgar) is through CTrip.com, where you can comparative shop from the various Chinese airlines. It’s the Expedia for China travel and has display options in English and takes International credit cards (for a 3% fee). Chini Bagh Hotel has 5 types of rooms: dorms (30 RMB, $4.2 USD), fancier dorm room (35 RMB, $5 USD), double in old building (280 RMB, $40 USD), double in new building (380 RMB, $54 USD), and suites in new building (600 RMB). If you stay for 7 days or longer, an unadvertised 100 RMB ($15 USD) can be discounted per day if you ask for it. It’s super busy here with frequent bus full of international tourists being unloaded here, so I would reserve a few days in advanced. They speak very good English. If you have a laptop, and want internet in your room, ask for it at reservation time, as only a limited number of rooms have hard wired DSL internet access. Internet costs 20 RMB/day, or you can follow my instructions below to access it for free in these rooms. Even if you told them that you were using the Internet in the rooms, all ready to pay for it, they would give you no instructions on how to set it up. I spent many hours of frustration before getting it to work. The hotel also doesn’t know how to track who is using Internet and will likely forget to charge you for it even if you’ve explicitly told them (several times) you would like to pay for Internet during check-in. Pre-requisite: PC Laptop (not sure how to do this on a Mac. I’m on Windows XP), Internet Cable to plug into the modem (they don’t provide it). User name is your room’s phone number plus “-ks”. Example, in room 4017, the phone number is 2980821. Thus, the user name is “2980821-ks”. The password is “0000″ (four zeros, or it might be ‘o’ if zeros doesn’t work). Hit Next and you should see a connection shortcut on your desktop. Double click on it and enter the password again to connect. Please lemme know if this works for you. If it doesn’t, let us know the updated way. The animal market is way more interesting and impressive than the sunday market. I would head to the animal market first and plan to spent most of the day there. The market takes place on dirt, so it’s a good idea to bring a scarf or something to cover your face, as it will get super dusty in the main livestock market area. This entry was posted on Wed, Nov 5, 2008 at 1:15 am and is filed under China, Traveling. Email this page. Recently a friend passed along a link to your site and I’ve been reading an article every morning. After I read I begin implementing throughout the day. Love every single word that you write. You are one of the most high-caliber girls I’ve ever come across. You’ve single-handedly renewed my hope for meeting an amazing woman out there. Alright, I’m half-joking. Because I know there are plenty of amazing women out there, but you’re the awesomest. P.S. – I love avocados. They are the perfect food. One of your next avocados will be from me. Mmmm. Keep healthy, strong, and fueled up so you can continue to help humanity through your efforts! Brings back memories of my travels around China almost 2 years ago. What a huge, crazy, amazing country and culture! The well-known words you have encountered belong to the same Indo-European language roots. When the Eurasian Nomads conquered western (Europe) and eastern (India, China etc.) countries ca. 6000 years ago, they have brought their own language to the natives. You will find same/similar words in languages of all peoples with hierarchy and rulership in contrast to egalitarian societies (Native Americans and other tribal societies). Awesome awesome photos!! 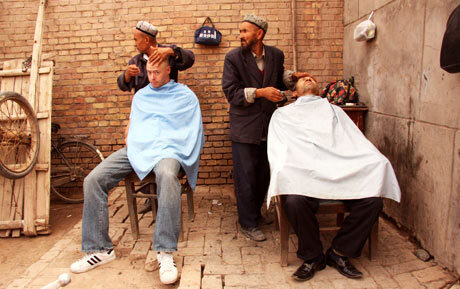 I’d like to visit kashgar some day!! 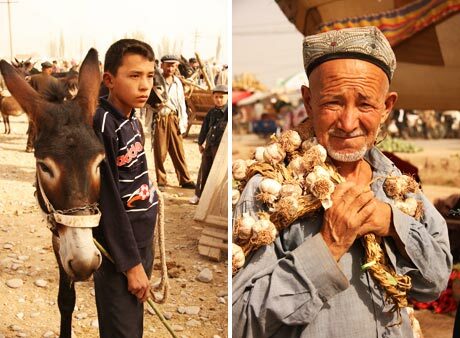 Both posts on Kashgar have been incredible to read and view. You introduced me to a region I admittedly knew nothing about, and your photos are so vibrant. I’m now seriously thinking about planning a trip there in early 2009…I haven’t yet been anywhere in China! Love your posts and pics. You guys did a great job and it looks like you enjoyed yourselves!